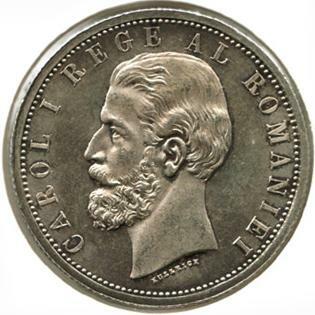 denomination "5 L", year 1901, Romanian coat of arms, letter B and wheat ear, the signs of Romanian mint, outer pearl circle inscription "CAROL I REGE AL ROMANIEI" meaning "KING OF ROMANIA" and CAROL I head facing left, outer pearl circle. Under the neck lies KULLRICH, the engraver's name. The diameter is one millimeter larger than the one of the previous 5 lei issues. 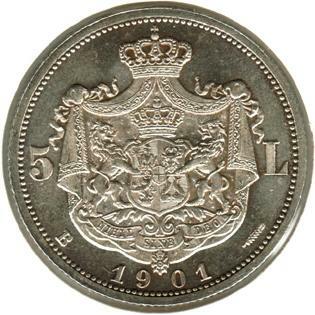 Although bearing the Romanian B (standing for Bucharest), the 5 lei coins from 1901 were struck in Hamburg. According to the book Monetele României (Coins of Romania, Iliescu and Radovici, 2004), the mintage of this coin was 68.850 pieces. The magnificent silver coin pictures above are present on Romanian coins through the kind permission of Mr. Radu Lissner.